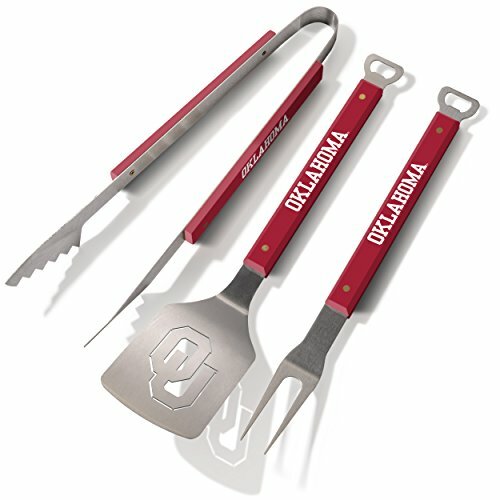 Get your grill game on with an officially licensed set of Oklahoma sooners sportula barbecue tools. The barbecue tool set includes a sportula, a pair of tongs & a grill fork. Each tool is made from heavy-duty stainless steel with brass-riveted hard maple handles. Oklahoma & the sportula logo are stamped on the handles & the team logo is laser cut through the blade of the sportula. The sportula & the fork both come with an integrated bottle opener. An unforgettable gift for any Oklahoma sooners fan & the most noticed accessory at any tailgating event.